Conker Tree Science was started by and is run by two ecologists, Michael Pocock and Darren Evans. They love doing research and engaging with anyone about this importance of nature. This project is one example where they can do both at the same time! Dr Michael Pocock (on the right) is a researcher at the Centre for Ecology & Hydrology in Oxfordshire. He is part of the Biological Records Centre which supports the recording of natural history for the benefit of scientific research and conservation. Developing the Conker Tree Science project was a perfect stepping stone for that job. He undertakes research in how different species interact with each other and how people depend on nature. Increasingly, he does more and more work with 'citizen science'. 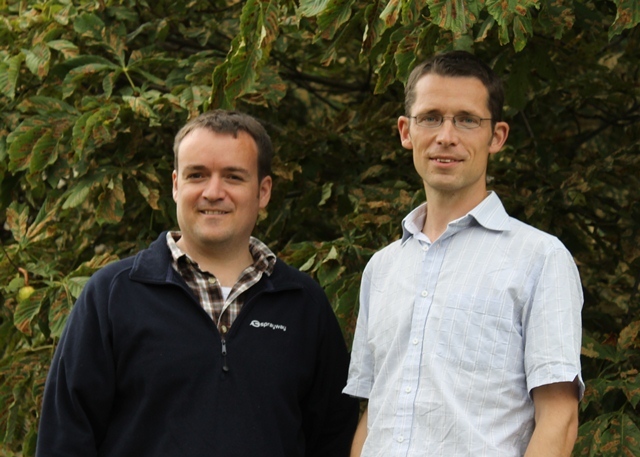 Dr Darren Evans (on the left) is a senior lecturer in conservation science at the University of Hull working on the impacts of environmental change on the structure and dynamics of ecological networks and the consequences for plant and animal populations.